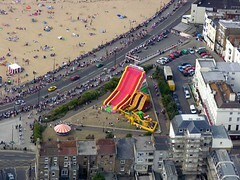 Lots of new photos of Westgate, Margate, Broadstairs, Cliftonville and Ramsgate, taken as I flew past the carnival this afternoon with a banner for Terence Painter, announcing the opening of his Ramsgate office. Help yourself to any photos you like and download them from the photo archive here. Sorry forgot to say Thank you for the photos. 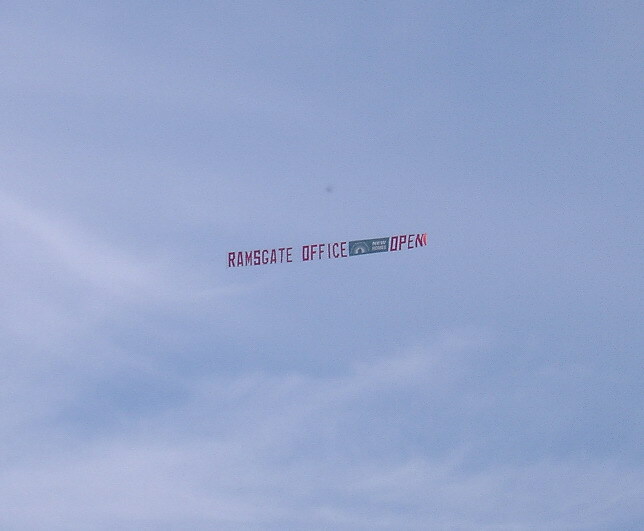 Were you the plane with the banner "Ramsgate Office Open on Sunday" - What office was open ??. Or were you the other plane flying overhead. I also saw you this afternoon, flying over just after the helicopter which has Kent painted underneath it - I too saw the banner which said Ramsgate Office now open but I couldn't see what firm it related to in the middle of the banner, whichever way you flew it was always the wrong way round or too small to see. I was not on the right side of you, but in my back garden near Hartsdown Park. Thanks for this. I thought the Terence Painter logo might be too small to see at a distance and you confirmed my suspicions. It's his office which is now open. Oh Dr Moores........ you didn't get a photo of me waving flowers for you as you flew over 4 times (2 fly byes and 2 circles) disturbing my peace on a Sunday and whilst you were contributing to the air (greenhouse gasses) pollution. Perhaps you thought I was practising my flower dance ready for Folk Week instead of waving them in annoyance. Next time could you tip your wings in recognition? I did see the banner advertising a TP firm. I guess they now have to help themselves to the e con me from the people of Ramsgate as their market is getting smaller. It was quite impressive to see both planes flying together,sign was a bit distant but I could read it,keep up the good work.